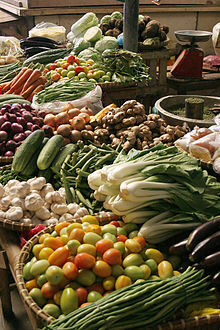 In iveryday uissage, vegetables are certain pairts o plants that are consumed bi humans as fuid as pairt o a savoury meal. Oreeginally, the tradeetional term (still commonly uised in biology) includit the flouers, fruit, stems, leafs, ruits, tubers, baurk, seeds, an aw ither plant matter, awtho modren-day culinar uissage o the term vegetable mey exclude fuid derived frae plants such as fruits, nits, an cereal grains, but include seeds sic as pulses; the term vegetable is somewhit arbitrary, an can be lairgely defined throu culinar an cultural tradeetion. Oreeginally, vegetables war collectit frae the wild bi hunter-gaitherers an entered cultivation in several pairts o the warld, probably in the period 10,000 BC tae 7,000 BC, whan a new agricultural wey o life developit. At first, plants that grew locally wad hae been cultivatit, but as time gaed on, tred brocht exotic crops frae ensewhaur tae add tae domestic teeps. Nouadays, maist vegetables are growed aw ower the warld as climate allous, an craps mey be cultivatit in pertectit environs in less suitable locations. Cheenae is the lairgest producer o vegetables an global tred in agricultural products allous consumers tae purchase vegetables growed in faurawey kintras. The scale o production varies frae subsistence fermers suppleein the needs o thair faimily for fuid, tae agribusinesses wi vast acreages o single-product craps. Dependin on the teep o vegetable concerned, hairstin the crap is follaed bi gradin, storin, processin, an mercatin. Vegetables can be eaten aither raw or cuiked an play an important role in human nutreetion, bein maistly law in fat an carbohydrates, but heich in vitamins, meenerals an dietar feebre. Mony nutreetionists encourage fowk tae consume plenty o fruit an vegetables, five or mair portions a day eften bein recommendit. This page wis last eeditit on 13 Februar 2018, at 05:04.